Before I go on to write about my adventures in Auckland, I would like to say a few more things that I left out about my trip in Beijing. The other thing that amazed me was that in the Hotel that we were running the camp, every room had a desktop computer! Yes, EVERY ROOM! A DESKTOP PC. Can you believe it! It was the first time I saw a computer in every room. And they are quite new too! 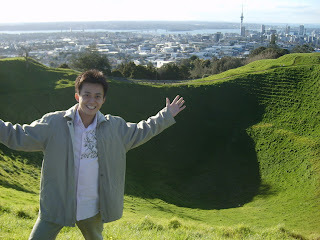 Now, let me share with you some of my adventures in Auckland. It was winter there and it was damn cold. 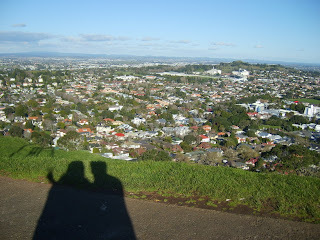 Come to think of it, I experienced Summer in Beijing and then Winter in Auckland. Two extreme weathers in less than 2 months! I think my body got a bit confused. The whole of New Zealand has a population of around 4 million people. Almost the same as Singapore's population. But the country is so huge! And guess what, the population of their sheep is around 60 million! New Zealand has so much land and the beauty of the landscape must have seduced Hollywood to film Lord of the Rings there. I think for most people now, New Zealand is known as The Lord of the Rings filming site. Auckland is New Zealand biggest city with a population of 1.4 million people, which isn't that big. This is perhaps the only place in the whole of New Zealand that has high-rise buildings. There really isn't much to do in Auckland and if you want to have some outdoor activities, then you have to travel at least 1 hour away. For me, I didn't travel just 1 hour, I traveled 5 hours! And I didn't just traveled, I rented a car and drove for 5 hours! It was the first time that I sat behind the wheel for so long. And it wasn't really a relaxing drive, because there was only a single lane for most part of the journey, and the roads have countless bends. Can you imagine, I had to keep extremely alert for 5 hours? Not to mention that it was my first time driving in New Zealand too. But of course, I had my Thai friend, Aon, to keep me awake by talking to me. Hah, I didn't even mention where I was going. 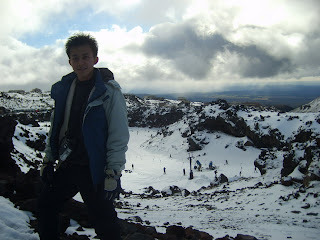 Well, I was on a one-day trip to Mt Ruapehu for Snow Ski! My longtime friend, Aon, from Chiang Mai, was studying there and she planned this outing for me and for another friend of hers from The Philippines. It was like an international outing for the 3 of us. Just for your info, New Zealand doesn't snow in Winter. Maybe only near the mountain tops will you experience snowing. (That is if you are lucky.) By and large, it doesn't snow at all. So, I had to travel down south for 5 hours to find a snow-caped mountain for snow ski. According to the map, I probably traveled more than half of New Zealand's North Island! (NZ is divided into the North and South Islands) Of course, after the trip, I had to drive 5 hours back! The drive down there was really cool as I got to see the beautiful landscape that NZ had to offer. Of course, I saw more cows and sheep along the way than human beings. We stopped by a few places along the way we went past the "Hobbits Village" or "The Shire". 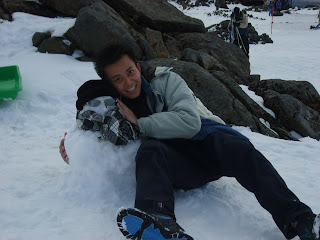 When we finally reached Mt Ruapehu, I was sooo excited! I couldn't believe that I was walking on snow! Snow skiing was totally new to me and I didn't know what to expect. All I wanted was to do something that I have never done before. And it was anything but easy. I had problems even putting on my skiing gear! 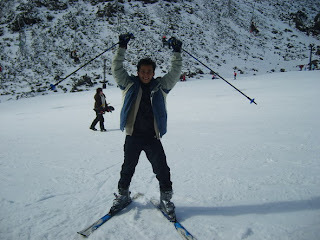 Once that was done, I thought I was all good to go and went on the snow immediately. Guess what? Gravity just pulled me down the slope and I couldn't brake! Not that I couldn't, I just didn't know how. The next thing I know, I was flat on the ground. So I learnt the first lesson in snow skiing: If you want to stop but don't know how, just fall down. Hey, this is true. For me at least. Snow skiing to me isn't about getting it right. It is just about experiencing it. I am not sure how many times I crashed and burned but I sure did have fun. Midway through learning the craft, guess what happened. It started to SNOW! As in SNOWING! From the sky! I couldn't believe it! Like I mentioned above, it doesn't usually snow there. And I was so excited when the snow came down. Initially, I was avoiding those "white things" that were coming to my face, until I realised that it was actually snowing. Whooo! First time in my life I experienced snowing! The snow lasted probably for only 5 minutes but I count myself blessed to even experience snowing. COOL!!! The next logical thing to do when you are in snow land is to build a snowman. Me and my 2 other friends decided to build a snowman together. Oh man! I didn't know building a snowman could be so difficult. I always thought it was easy until I started building my own. It was soooo exhausting! We had to dig the snow and pile them up together and make the snowman look fat. And "it" needed an awful lot of snow to make it fat! It was a tiring job even for 3 people. In th e end, we managed to build a small snowman after a whole lot of work. (See picture left) I think it can be called a snowboy. Not too bad for a first-timer, I guess. 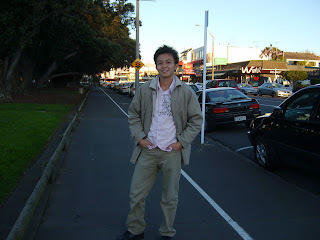 There was still something on my mind that I want to accomplish bef ore I leave New Zealand. That is to do BUNGY! Yes, I was crazy enough to do Bungy. It is one of those thing that I will do before I die. 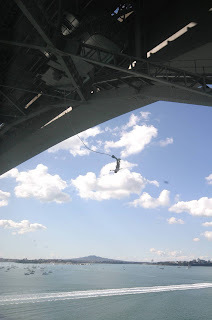 And so I took up the challenge and went to pay $100 NZD so that I could jump off the Harbour Bridge. Crazy right? Maybe. 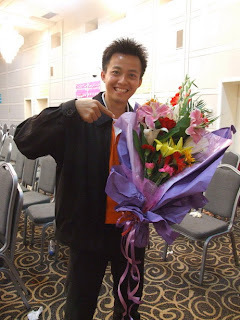 I was clam and relaxed throughout the whole preparation process. Not a tint of fear in me. Even when I was just next to the jumping platform and the crew were strapping me up, I was all cool. No fear. Then the moment arrived. I was asked to walk to the end of the platform. Still ok. But when the crew ask me to put my feet halfway out in front of the platform, I was freaking out. I didn't show it, of course. In normal circumstances, I wouldn't look down. But in this case, down is the place that I was heading towards. So I had to know where I was going right? Wrong! My heart suddenly pumped so fast that I thought it was going to burst out from my rip-cage. Then the crew shouted the command for me jump with a countdown from 5, 4, 3, 2, 1, go! And I jumped! No turning back. 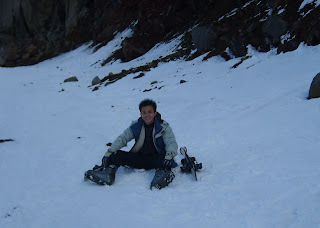 Apart from experiencing the snow, it is by far, the most exhilarating experience in my life. Even though it lasted only for a few seconds, it was worth it. I mean, how many times in your life do you get a chance to jump off from 47 meters high bridge? And not die? I told myself, if I can overcome this challenge, then what else can I not do? It was such a powerful experience for me. And fun too! You can bet that I will be going for higher jumps in the future. Wheeee! Now you can see why I entitled this blog entry as "First Time Adventures." 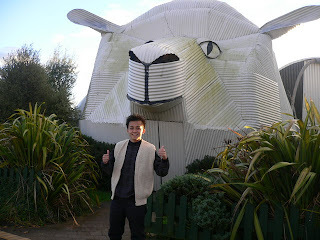 This trip to Auckland really allowed me to do a lot of things for the first time. I truly enjoyed myself to the max! It will be one trip that I will never forget. Bungy jumping is not for the faint-hearted. However, if you can, go and do a bungy jump and I can promise you that your LIFE, WILL NEVER, EEEEEE...........EEE.......EEVER, BE THE SAME AGAIN!